This Flower Pendant was inspired by the warmer weather. 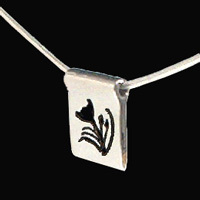 The silhouette is carved through solid sterling silver, making a novel way to show a flower... in reverse. An 18" sterling silver chain snakes through the pendant effortlessly. The overall effect is one of chain and pendant becoming one seamless silver design.